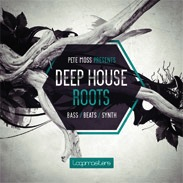 Pete Moss delivers an incredible Deep House sample collection for Loopmasters. It travels back in time and takes all the best sounds and influences from the roots of Deep House and Tech music and transforms them into future classic ear candy. Pete has put together one tidy royalty free sample package using all the skills obtained throughout his dedicated career to the dance music scene, fusing Vintage Analogue and Digital synths alongside modern day plug-ins Pete used extensive layering and processing techniques to create brand new hybrid sounds that still have that all important classic sound retained. Over his career Pete has developed into one dance music’s finest talents and reminds us constantly with his late night sets at Pacha Ibiza, Ministry Of Sound Uk and extensive US tours whilst his soulful and impeccable production skills serve up a steady stream of releases on labels such as Ovum Recordings, Alola, Recline, Nordic Trax, Sound Between Movement and Straight Shot Records, and indeed his present releases are staples for the community that no self-respecting DJ would be caught without. Producers should expect to find Swinging Drums, Bubbling Basses, Warm Vintage Keys, Modulating SFX, Full Fat Multi Samples and Precision Sharp One Shots. In Detail Expect to find 436Mb of 24Bit 44.1Khz loops and sounds including 35 Bass Loops, 45 Drum Loops, 52 Music Loops, 10 Ready to Play Drum Kits, 21 Bass Shots, 10 Bass Multi Sampled Instruments, 20 Synth Shots, 10 Multi Sampled Synth Instruments, 50 SFX, 132 Rex2 Files and 72 Soft Sampler Patches for Kontakt, Halion, Exs24, Nnxt and Sfz Formats. The Collection is also available as Apple Loops, Ableton Live pack and Reason Refill formats to purchase separately. The One Shots and Multi Samples are Tagged Ready for use in Native Instruments Maschine software. If you like your sounds Deep and Techy then waste no more time and check out the demos and sample Pete Moss Deep House Roots.